With hot models, inspiring education, and a booth full of support from our ambassador network— The ARROJO Creative Team brought the heat to IBS 2018. The ARROJO Creative Team took us on a space odyssey with their main stage presentation, featuring the newest cut, color and waving techniques from creative collection L.S.D. Color team leads, Zach & Ashley presented their monochromatic color blocking techniques while Lina, Alex, and Nick demoed their technique-shattering reverse concave cuts. Our texture specialist, Blaine showcased our new brick-layering American Wave technique and wowed the audience with her model’s massive texture. Followed by Expo Hot Shot contest winners, Alexis Hoban & Kelsey Cowan, who made their first main stage appearance to present their cut & wave model to the audience. With education at the front of our roster, our texture masters certified 34 new stylists in the en vogue American Wave service. On day 2, Nick Arrojo and ambassador salon owner, Stephen Adams, facilitated an entertaining razor-cutting seminar, where they taught the rule-breaking L.S.D cutting techniques from the main stage show. 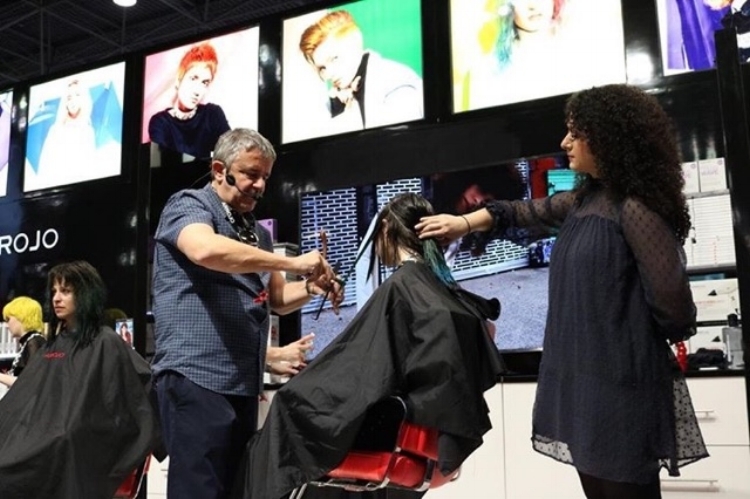 Back at the booth, we jammed all weekend with our uber talented ambassador network, creating funky cuts and offering inspiring industry tales for guests to reflect on. A special shout out to Derek Anthony, Stephen Adams, David Gatt, Tracy Vazquez, Jason Smith and the rest of our guest artists for holding down the booth and sharing the ARROJO culture.